This 16pc dinnerware set - animals is unique in that all pieces are totally different and artistically designed with the animal theme. Mara shows different animals such as howling wolves, bears and a moose along with some beautiful mountain scenes on her stoneware dinnerware pieces. 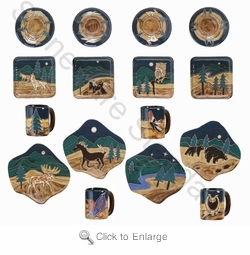 Check out our Animals - Individual & Complement Pieces to fill out your Mara Dinnerware set.